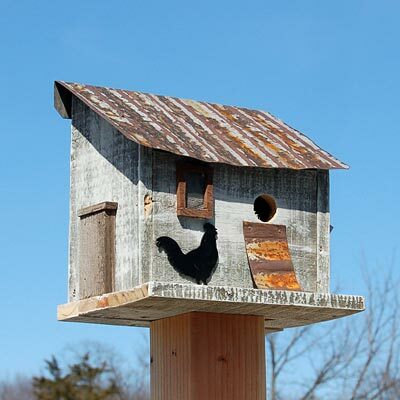 Enhance the avian theme in your backyard in a whimsical way with this Bird In Hand Cumberland Chicken Coop Bird House. The fantastic, reclaimed wood body forms an environmentally sound shelter, while its charming details bring a rustic motif to your yard in moments. Its rectangular frame and sloped metal roof form a classic chicken coop shape, and a black, plastic rooster silhouette on the front of the piece furthers the theme. A faux nest box occupies one side of the shelter, and a piece of metal forms a faux chicken ramp to complete the look. This ramp leads to the 1.125" diameter entrance hole, which allows wrens or chickadees to access the interior. The aged metal roof fully protects the nesting cavity from rain, and a ventilation gap beneath its overhang helps regulate the internal temperature. A few holes on the base of the home allow any captured water to drain. A metal panel covers the 2" cleanout hole on the back of the shelter, and the flat back makes the item simple to place against a wall or fence. For added display options, affix a mounting plate (not included) to the bottom platform and situate the unit on a post or pole. Crafted from reclaimed wood, this abode brings an environmentally friendly feel to the yard, while its aged white finish furthers the farming motif. Add poultry to the list of birds you see in your garden with this Cumberland Chicken Coop Bird House. Made in the USA. Erva Bluebird House Two Piece Mounting Pole, Black, 5' 10"